The many faces of Santa are widely available in doll head form from both craft stores and the craft sections of bargain stores as well. Pick up your favorite and stock up on a few hot glue sticks to craft this easy Christmas wreath for your front entryway. Referring to the photo, hot glue pine cones to the ends of branches. Place the glue at the flat bottom of the pine cone and attach to the very end of the branch. 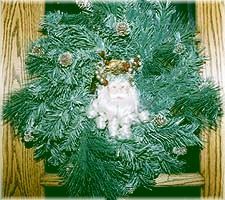 Using wire, attach a Santa face ornament to the centre of the wreath. You can spray a little snow to the edges of the branches if you like to add a little more texture too. Have two porch doors to decorate? Make a matching Mrs. Santa wreath with a purchased Mrs Santa doll head to complement this one and make a pair.